What Is Strategic Parts Management? If you work with supplier, commercial and standard 3D parts, you need a Strategic Parts Management (SPM) solution. Are you looking for a way to control your supplier or standard components? Do you want to “Google” engineering data within your own system? Do you want to stop master data chaos? Let´s find out how the concept of “Strategic Parts Management” (SPM) can help you be more successful! Get more use out of your parts. 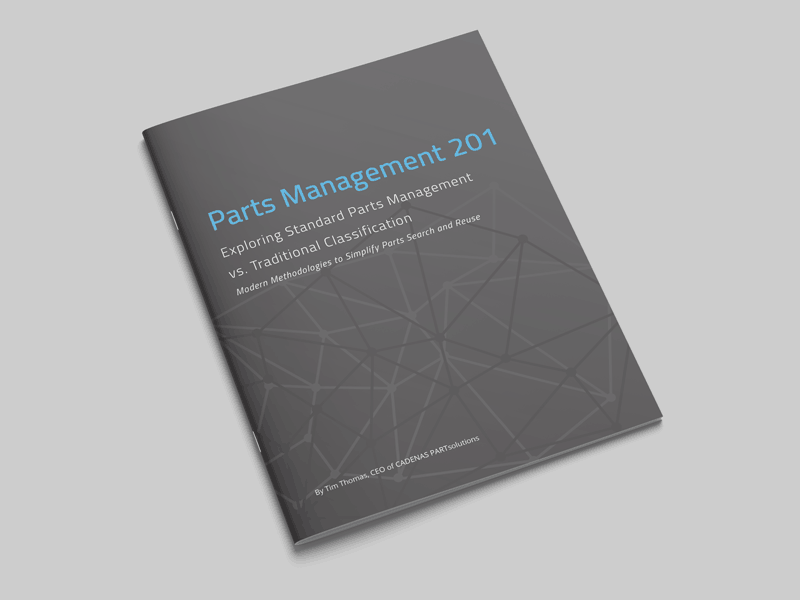 Start organizing your standard 3d parts, supplier parts, and commercial 3D parts today with our free ebook. Parts and Parts and Parts – Oh My! If you are involved in an engineering process or supply chain, you daily deal with creating, managing or searching for digital representations of your products and their sub-components. Every OEM (Original Equipment Manufacturer) product is assembled out of three types of basic components – let´s call them “parts”. Industry standard parts are defined by widely recognized standards developing organizations. Depending on industries or areas, regulations and supplier availability, different industry standards are used. Examples are ISO, ASME, DIN, JIS, EN or GB. Industry standards are preferred due to their pre-defined and consisted specification and supplier independent quality. In some industries, up to 90% of an assembly line is made up of purchased parts. A ton of Tier 1 supplier offer components fulfilling standard functions. Typical examples are bearings, resistors, cylinders, switches, springs etc. To use supplier parts means to rely on the supplier’s competence and experience – not challenging your own team developing highly specialized and standardized items – not taking responsibility about production and logistics. Everything you can´t order from a catalog – developed on your own to complete your assembly – produced internal or on behalf. Often costly to develop and produce. Hard to reuse in other assemblies. Companies using a variety of different IT systems to manage their engineering data. There may be more but the following three are used in almost every enterprise environment. CAD (Computer-aided design) Create, modify, analyze or optimize a design. PDM (Product data management) Manage, control and publish product data. ERP (Enterprise resource planning) inconsistent and business related product data. Due to the functionality of the different systems, engineering master data is spread over different databases and file formats. In general, CAD contains geometry, PDM contains master data and ERP contains master and transaction data. But that´s not all: If you are in an enterprise organization it is a high probability that there is more than one of each system in use. Best case: You have streamlined your workflows and connected your systems, so the information you need in each system is created and updated automatically. Nevertheless, does that help you in future to speed your design time? Does it help to drive innovation, to reduce parts, to clean your master data? Does it help your purchasing department to make better business decisions? To define action items you first need to know where in your organization you do have the potential for improvements. Efforts in the past were designed to be able to handle the surplus of tasks caused by shorter development cycles, regulations and fast growing organizations. Anyway, to stay in the game and ahead your competitors today, you have to come up with more innovative approaches. SPM is one of these innovative approaches – and it´s proven by many SMB´s and enterprise organizations. Through intervention in the very first step in your design process, it gives you the most leverage, influencing the costs of your processes and products. That means you stop trying to costly fix and improve what could have been done better from the beginning. Almost half of your engineering time is wasted on unproductive tasks! Make sure you have a system in place that gives your employees the power to fast and easy find, compare and consume data that is already there. To make a good and fast decision the user has to have access to information from all systems for all three part types in a standardized format. It´s good to improve workflows to reduce process expenses for each part. It´s better to spend zero expenses for parts you can reuse instead of creating new ones. Make sure your system prevents duplicate or very similar parts. Again – it affects all three part types! First – control what components are added to your systems. Not every vendor is preferred. Not every part is available at your production site. It is extremely costly to change components after the product development is actually finished. Pre-defined conditions avoid that these parts will be used. An SPM system guides your engineer around them and presents alternative components. Second – control what kind of data is added to your systems to feed your downstream applications. Does your Engineer care about the HS code of every component, what you will need if you want to ship your final product to abroad countries? What information you will need in future for simulation or IoT-applications? Is the data you feed into your systems valid, up-to-date and in a standardized format? You have to get the best possible data quality into your systems. Everything else is wasting money! Following these three steps, you have to give your engineers access to a complementary platform that does connect and improves the workflows in and between all existing systems. It also has to disrupt the existing procedure where standardization and purchasing departments are not able to control what data is created in the engineering process. This short introduction gave you a first idea how a strategic parts management approach can revolutionize your whole product development process. It avoids costs and effort before they occur. In preparation for the 4th industrial revolution, can you wait to take advantage of SPM? Senior Manager, Global Business Development PLM & ERP Solutions | From our CADENAS parent company in Augsburg, Germany, Johannes is our Strategic Parts Management expert. He works closely with each affiliate team in the USA, Japan, China, India, the UK and France to share his knowledge about the SPM solution and associating projects.